Crossville, Tennessee, native Katherine Walker Hill stars as "Glinda" in the touring production of "The Wizard of Oz." It's coming to TPAC's Jackson Hall Feb. 8 - 10, 2019. "At the very end of the day, good storytelling is timeless," says Katherine Walker Hill, reflecting on the immense longevity of the beloved movie musical, The Wizard of Oz. "It speaks to everyone; it's multigenerational," she adds. While the timeless movie starring Judy Garland marks its 80th anniversary this year, the book that it's based upon — L. Frank Baum's The Wonderful Wizard of Oz — celebrates 119 years come this May. This weekend, your family can enjoy the stage musical, which is based on the 1939 movie. Hill is a Crossville, Tennessee, native who plays both "Glinda" and "Aunt Em" in the current touring production of The Wizard of Oz that lands at TPAC Feb. 8 - 10. It's her first national tour, and the 35-year-old can't wait to perform on the stage where she watched so many shows growing up. NP: HOW EXCITING IS IT FOR YOU TO BE PERFORMING ON YOUR HOME TURF? KWH: It's really a thrill. I grew up going to TPAC. My parents would take me there to see shows. It's the best thing we have to Broadway. If you grow up in Tennessee and love Broadway, TPAC is where you go. It's going to be surreal to actually play on a stage that I grew up seeing so many iconic musicals as a child. The first show I remember was Peter Pan. I remember thinking how magical it was because of all the flying. 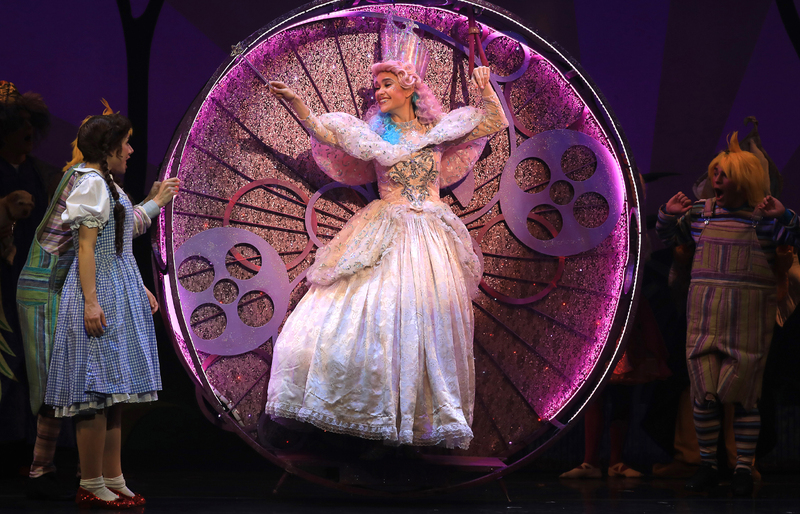 It's exciting now as an adult to be someone who's flying onstage across the country as Glinda. Everything has come full circle in that regard. NP: WHEN DID THE ACTING BUG BITE? KWH: I'm lucky because my mother owns a dance studio in Crossville, so I grew up dancing. I was in my first professional production at the Cumberland County Playhouse when I was 6 years old. I did Annie, and fell in love with the stage. I remember watching the Tony Awards when I was 10 or 11 and realizing that you can actually do this for a living, not just for fun. I loved doing it for fun, but if you work and train really hard, this is actually a real job. It was great to have the Cumberland County Playhouse in my backyard to help me along my theater path. I stayed on there as much as I could, then went to St. Louis to attend the Conservatory of Theatre Arts at Webster University. NP: GIVEN THIS TOURING SHOW IS BASED ON THE 1939 MOVIE MUSICAL, WHAT ARE YOU MEMORIES OF THE MOVIE GROWING UP? KWH: The Wizard of Oz is such an iconic movie musical. It's just brilliant. The effect of going from black and white to color was amazing. It's a beautiful story, and Judy Garland is simply amazing. Growing up and wanting to do theater, I always thought to myself, "I'll never play Dorothy, it's just not my type. But maybe someday I'll play Glinda." I've always been in tune with Glinda and enjoy her scenes. I watched it this past Thanksgiving. It has a holiday feel for me because it brings family together. That's what this iconic movie does. It speaks to everyone. My grandparents know it, my parents know it, my niece and nephew know it. It's something everyone can enjoy and take something out of. The entire family can gather to watch this and be happy and feel a sense of togetherness. NP: YOU PLAY GLINDA AND AUNT EM. WHAT DO YOU ENJOY MOST ABOUT EACH OF THESE ROLES? KWH: I love Glinda and Aunt Em. I love the maternal aspects of them. I love that they're both, in their own way, guiding Dorothy back home. The theme of the show is the same theme of my character — to be a maternal guide. Glinda sets Dorothy off on her journey, "follow the yellow brick road," and then she's there at the end to bring her back to Kansas. NP: WHAT IS YOUR FAVORITE SCENE? KWH: I love Munchkinland. When the Wicked Witch comes out and I give Dorothy the ruby slippers, it's fun to see the kids' reaction. The Wicked Witch and I have a little showdown there. Everyone's waiting to see those shoes! NP: SINCE THIS STAGE PRODUCTION IS BASED ON THE ICONIC MOVIE, DOES THAT CREATE EXTRA PRESSURE WHERE AUDIENCE EXPECTATIONS EXIST? KWH: It's a huge responsibility to play these characters because they are so beloved, and people know them so well. There are times when people are mouthing the words along with us — that's how close it is to the movie script. That's how many times people have seen the movie; they know what I'm going to say before I say it. There is a fine line between giving people what they want and the reality of live theater. I'm Katherine Walker Hill, not Billie Burke. The goal is to tell the story as truthfully as possible. I do realize what a huge responsibility it is to love these characters and give them to this audience who loves them as well while we share that for two-and-a-half hours. NP: GIVEN ALL THE MAGIC WITHIN THE STORY, WHAT CAN YOU TELL US ABOUT THE SHOW'S SCENIC DESIGN? KWH: If you love technical theater, this is the show to see. There's lots of flying. I fly in and out in a giant pink bubble, and I make it snow on the poppies. You'll see the Wicked Witch does melt right before you. I still don't fully understand how they do that. Every night, I'm like, "THIS IS AMAZING!" I think one of the best things is when Kansas becomes Munchkinland. You see all the dull colors and rundown farm of Kansas, then the twister comes in — the twister is just amazing! — and suddenly this colorful beautiful land appears. NP: WHAT DO YOU HOPE CHILDREN TAKE AWAY FROM THE EXPERIENCE? KWH: I hope it's many children's first time seeing live theater. It's a great opportunity to introduce a child to theater. I hope they leave with a sense of magic. It's a magical show. There's something magical about live theater in general, having all this happen right in front of you. I hope they leave much like I did my first time seeing Peter Pan ... feeling that magic really is everywhere. We're a jaded society, so if kids leave believing there's magic in the world, then we've done our jobs. Showtimes: Fri 8 p.m., Sat 2 & 8 p.m., Sun 1 & 6:30 p.m.